a Japanese waka poet and aristocrat. 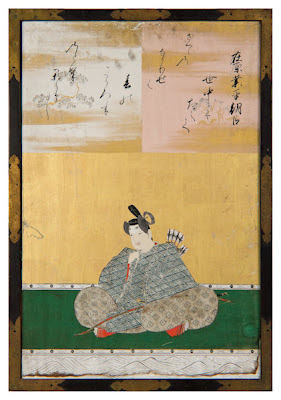 He was one of six waka poets referred in the preface in kana to Kokin Wakashū by Ki no Tsurayuki, and has been named as the hero of The Tales of Ise, whose hero was an anonym in itself but most of whose love affairs could be attributed to Narihira. He was the fifth son of Prince Abo, a son of Emperor Heizei. His mother Princess Ito was a daughter of Emperor Kammu, so he was therefore linked to Emperor Kammu by both maternal and paternal lineage. 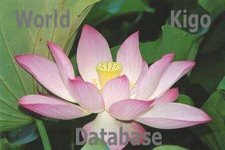 Along with his other brothers, he was relegated to civilian life, receiving a new clan name, Ariwara. Although he belonged to the noblest lineage, his political life was not prominent, especially under the reign of Emperor Montoku. During the thirteen years of the Emperor's reign, Narihira was not raised to a higher rank within the court. This setback was supposedly caused by a scandal involving him and Fujiwara no Takako (藤原高子), an imperial consort or another royal lady. Both love affairs were referred to in The Tales of Ise. As a waka poet, his thirty waka were included in Kokin Wakashū. Traditionally he was considered the model for the hero of Tales of Ise, which contains many of his waka, although not all waka in it were his works and some of its episodes can hardly belong to his real life. Thanks to a reference to him in the preface of Kokin Wakashū he is listed as one of the Six best Waka poets and also one of the Thirty-six Poetry Immortals. He has been traditionally regarded as the epitome of the beau homme in the Japanese culture. It is believed he was one of the men who inspired Murasaki Shikibu when she created Hikaru Genji, the hero of Genji Monogatari, especially in the aspects of her story concerning forbidden love between a high ranked woman and a member of the court. When he visits his lady love, he had to climb over an old crumbling wall.
. neko no tsuma hetsui no kuzure yori kayoi-keri . zaigo implies that he was the fifth son. It was the 28th day of the fifth lunar month. 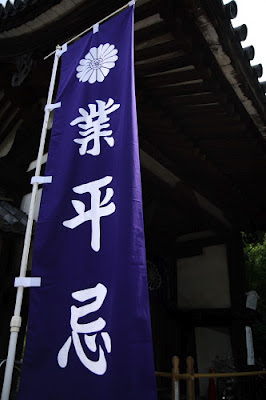 His memorial day is celebrated here on May 28.
. Memorial Days of Famous People .
. Ogura Hyakunin Isshu Poems 小倉百人一首 . so very soon as today. Yesterday I visited Futai-ji 不退寺 and Hannya-ji. Both are the small temples that sight-seeing tourists seldom visit. Futai-ji is the temple of Ariwara-no-Narihira (825 - 880) who is famous for his beauty and one of the best 6 poets in Tanka world. He has been told as the hero of the famous classic romance "The story of Ise". Story of Heike" and "Taiheiki story". During the period of the Nothern and Southern Dynasties, this temple belonged to Southern Dynasty, thus this temple has many sad stories in its history. Komachi lived here in Furukawa when she was old. She went to the Himuro Yakushi Temple 氷室薬師 one day and was found dead under the Torii gate in the evening. Narihira visited the Yasoshima 八十島 "80 Islands" (many islands), which are said to be there. From her skull there was grass growing through the eyes, so he did not say 小野 Ono, but あなめあなめ aname aname. 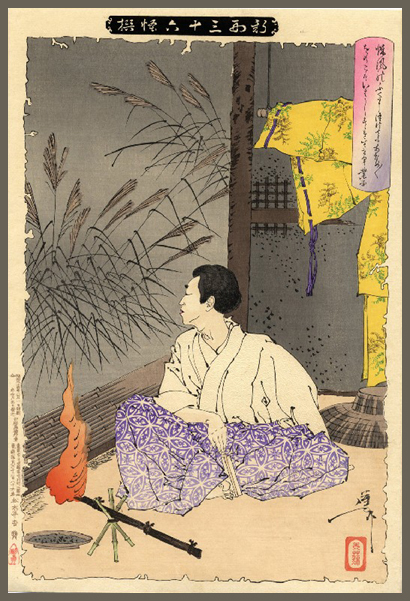 Ariwara no Narihira, a famous Japanese waka poet and aristocrat, is seen sitting on the floor by a window overlooking the garden. He fled the capital because of a love affair with Fujiwara no Takaiko and came to the east. He took lodging near the place where a famous poetess and a rare beauty of her time Ono no Komachi died. They both belonged to Rokkasen - the best-known six poets from the Heian period Japan. Alone and moody, he started imagining to see Japanese pampas grass growing through the eye-sockets of a skull in the garden. He thought it might be the skull of Ono-no Komachi crying. oh, how painful! how painful! in which pampas grass grows. When Narihira travelled from Kyoto toward the East, he heard that Oni demons come out at the pass 宇津ノ谷の峠 Utsunoya. So he performed some rituals to appease the demons at the Jizo Hall in 下野宇津宮素麺谷. 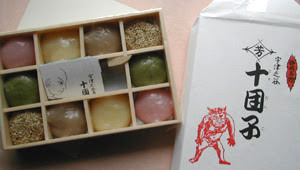 Jizo appeared dressed like a monk, transformed the demons into 10 small dumplings and ate them. People venerate the Jizo to our day. This is also the origin of the speciality 十粒団子 / todango 十団子 "ten dumplings" from temple 慶竜寺.
. Utsunoya Tooge 宇津ノ谷 Utsunoya pass - Shizuoka . 在原業平 Ariwara no Narihira. He made the girls pregnant in no time and children were born to him. But they say he was a fox. The Narihirazuka 業平塚 Mound for Narihira used to be in the compound of 南蔵院 Nanzo-In and 業平神社 Narihira Shrine. Narihira had visited this area and the mound in in his memory. The name of the bridge, 業平橋 Narihirabashi, is also very old. In 1662 the bridge was built East of 業平神社 Narihira Jinja Shrine.